Designed, injection-molded, and tested in the USA, these innovative products provide a long list of benefits to the end-user including inventory reduction, enhanced reliability, simplified installation, ergonomic improvements and more. Available exclusively from Richards Manufacturing, the R-800 is the embodiment of our dedication to innovation and improvement. The combination of multiple components in a single design, the R-800 reduces inventory, simplifies installation, and improves overall installation reliability. Trust Richards Manufacturing for all your utility needs. Compression Lugs and Splices, Vise Connectors, Hot Line Clamps, Stirrups, Cable Limiters, Crab Joints, and More. Richards is the Largest Manufacturer of Network Protectors and Accessories. 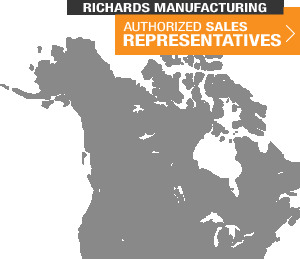 Receive more details about Richards Manufacturing and its quality products.